One of the most difficult tasks in legal internet marketing is motivating and showing attorneys how to write their firm’s blog. I have decided to create a recipe for blogging success. Step 1: Know your audience. Understand that each blog that you create has a target audience. Do some research and put some thought into it. If you’re a personal injury attorney in Duluth, MN writing about Mesothelioma, your most likely audience is going to be the taconite miners and their friends and family. Stop writing generic articles about premises liability or product liability. Speak towards your client’s needs. Instead of writing about faulty drugs, write about specific drug’s side effects. So for example, this blog will be targeted towards personal injury attorneys wanting to generate organic seo traffic through blogging. Step 2: Be sure to value what the customer values most. Since our target market was defined earlier, I think we all know personal injury value above all else…money. I am kidding. Quality relevant cases without wasting time on irrelevant leads. Be sure to always have what your customer values most in mind when writing your blog. Each client is different but over the course of a law career trends will become apparent. It also helps to be unique and original in your topic selection and write about rare and uncommon topics where your competition is too slow or inept to respond to the market, or the market might be viewed as too small to warrant a blog post. Were You Looking For Law Firm SEO or Paid Search? I spoke with a number of lawyers over the last several weeks that came to our agency in search of law firm SEO services……..at least that’s what they thought they wanted. Really what they were looking for was more business through the internet. The particulars of which strategy they should use in order to make that happen was the reason they were talking to me in the first place. However, there is enough hype around SEO these days that most law firms assume this is route they need to take. If a law firm has the appropriate budget, time, and resources available they should be involved in SEO, paid search, email marketing, social media, content creation, and every other type of online marketing avenue But in many cases, time and money are finite resources. As a result, a law firm must prioritize which strategies make the most sense depending on the needs, goals, and resources available. I talk with lawyers everyday that have websites they need help marketing. They want their websites to bring in more traffic, more leads, and more clients. When I ask how often they are updating their sites and what type of content they are producing, the other end of the line is usually met with silence. The fact is that in today’s online marketing universe, you need to produce new content for your website on a regular basis. Why Do I Need To Create Content? Google News recently became more social by releasing Google News Badges. At this time, the impact of these Google News badges isn’t entirely clear. However, when you start to look at the bigger picture you can see the puzzle pieces Google is putting together. The grand plan appears to be a fundamental shift in how Google views authority on the web. Google wants to tie authority and expertise back to individuals and real people. Proof can be found in the approach with Google+ and usernames and changes such as Authorship Markup. 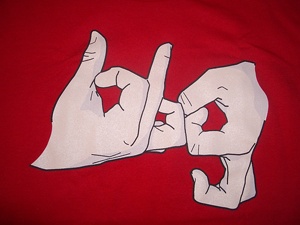 They are looking for signals beyond links and social is becoming a more important component of the algorithm. Google wants to identify subject matter experts and deliver their expertise to its users. What Is Inbound Legal Marketing? Inbound legal marketing is marketing that is focused on getting found by customers. It is the art of “pulling” customers to you rather than “pushing” your message out to them through interruption-style advertising. In traditional marketing (outbound marketing) companies focus on finding customers. They use techniques that are poorly targeted and that interrupt people. They use cold-calling, print advertising, T.V. advertising, junk mail, spam and trade shows. 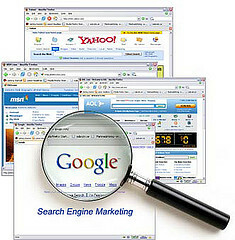 Where Is Search Headed & How Does This Impact Your Law Firm? Part of our jobs as web marketing consultants for law firms is to stay abreast of the changes that happen in our industry. In fact, what I believe separates the men from the boys is the ability for a company to understand not only how to leverage results with the way things currently are, but also being able to predict where things are going. Since search engine optimization is such an important part of any law firm’s web strategy, I wanted to discuss where I think search is headed and how this impacts your law firm. 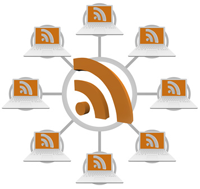 RSS feeds are a great way to keep up with news and topics related to your specific legal niche. I use my RSS feed as a way to centralize the blogs and content I want to stay up to date with, discover ideas for blog posts, follow the conversations in my industry, monitor my competitor’s activity, and more. However, many lawyers I speak with aren’t familiar with RSS or the use of an RSS reader such as Google Reader. It’s no surprise that getting to the top 3 spots of Google can help increase the traffic to your firm’s website. However, a new study shows just how dramatic the difference in click-throughs is among the different positions on the first page. Websites ranked number one received an average click-through rate (CTR) of 36.4 percent; number two had a CTR of 12.5 percent; and number three had a CTR of 9.5 percent. Being number one in Google, according to Optify, is the equivalent of all the traffic going to the sites appearing in the second through fifth positions. 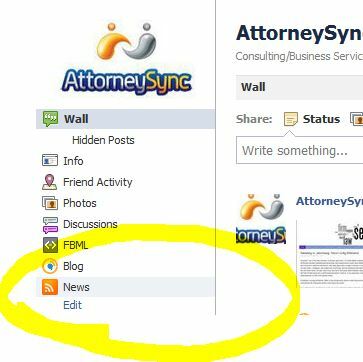 By posting articles directly onto your wall, the articles will appear in the newsfeeds of the individuals that “like” your firm’s Facebook page. This will increase the exposure of your content and deliver it to the individuals that signed up to receive updates from you. The service I recommend for automatic wall posting is called Networked Blogs. Networked Blogs is a Facebook application that allows you to register a blog, claim the blog as your own, and then syndicate the content from the blog onto your personal Facebook profile and any Facebook pages that you have admin access to. You are not required to syndicate to all these spots, you can pick and choose where you want the posts to appear. To get started you will head over to Networked Blogs and click the “Add your blog” button at the bottom of the page. This will take you to Facebook where you will login and arrive at the Networked Blogs application. You will click “register a blog” in the upper right. 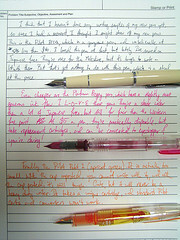 Fill in your blog information and click next. In the next step, the application will ask if you are the author of the blog. You will click yes and the app will request that you verify one of two ways. Either having Facebook friends verify or embedding a widget onto your blog (which you can subsequently remove after verification). While it is a good idea to eventually verify your blog, this is not a necessary step to do right away. To move ahead, you can simply click “I’ll do it later” underneath the verification method selections. This will take you to the registered blog page. From here you can select “Set up Syndication”. This will route you back to the Networked Blogs site to select your syndication options. From here you can choose the Facebook profiles and pages you want the blog articles posted to. You will also be able to select your options for what images to display with the post and whether to use the Networked Blogs toolbar. You will also have the option of adding a Twitter account where you can automatically feed in your blog posts. A component of any well developed law firm internet strategy should include the production and syndication of practice specific, professionally written content. Posting content directly to your website or blog should serve as the foundation of your strategy. However, taking advantage of syndication networks such as JD Supra, Avvo, or ExpertHub can get your content in front of a bigger, more widely read audience. This can be beneficial in driving more traffic to your site, building a larger blog readership, exposure for the firm and attorneys, and increased phone calls. That being said, it’s important to understand what steps to take when syndicating your content so that the search engines know you are the original creator of the articles. Ignoring these steps can result in sites you’ve syndicated your content to outranking your original articles. While these steps aren’t guaranteed to be foolproof, it will help to ensure you aren’t sending mixed signals to the search engines. If a search engine finds multiple instances of content that are the same it considers all but one of the articles to be duplicate content. When the article you post on another website links back to the original article on your site, it helps the search engines determine the source of the original. Make sure the link is pointing to the original article page and not just any page on your website. Once a search engine finds and indexes your original article it should time stamp the article and establish it as the original. In order to find out if the article has been indexed by Google, you can perform a search for the full url of your article. While this doesn’t always guarantee your article will continue to outperform the syndicated one, it helps to ensure you are sending the right signals. Provide a snippet, or couple of paragraphs of the article with a link back to the original. This way you can enjoy the increased exposure of the article on the syndication network and still drive visitors back to your site. This will also help avoid duplication of the entire piece of content. The noindex html tag tells Google not to index a specific web page. In this situation, your content will benefit from the exposure of the syndication site without hurting your own search engine visibility. The downside is that you have little to no control over whether a syndication partner will noindex a page. Most probably will not, however if this option is available or can be negotiated than it could be worthwhile. Want to learn how writing content for your firm’s site can help bring in business? Download AttorneySync’s Free Guide On Writing Web Content For Lawyers.